Do not accept another boring low-cost nameplate. 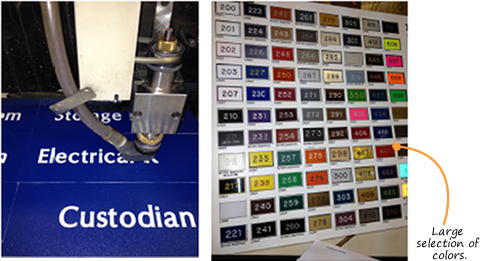 Available in a wide variety of colors, our engraved badges, plates and signs can be customized to your preference. Do you have an exact color in mind? Give our Customer Service Team a call. We’re more than happy to accommodate requests and find the color that’s just right for you! A professional nameplate reflects pride – pride in the organization and pride in the hard work that took you to that desk. When you look through our many designs, you can also see our own pride that we take in nameplates. Each is made by a skilled craftsmen or craftswomen. Each reflects a different theme. From the most conservative solid oak nameplates to high tech designs that can use branded images from your company, you will find the right look for your organization. Importantly, we pride ourselves on fast delivery and "fair deal" pricing. Most orders placed before 1:00 pm are shipped out that same day. We do not charge hefty shipping and handling fees to make up for loss-leader advertised pricing. We advertise the price that you get when you buy one plate, not thousands at a time. And, we offer batch pricing. When you order nameplates for a series of offices, you get a real break on pricing. sample, please place an order for just one custom nameplate. If you are not happy with it, you may return this for a credit for anyone of our other products. We will pay for shipping back. This may sound a bit obsessive, but I am quite keen to talk about nameplates. We understand that a nameplate is more than just another desktop object. Nameplates represent both identity and achievement. Each project, each person and each nameplate is unique.